"Nothing will stop me, whether I'm here, or wherever I may be." Help. What a poor excuse for a documentary this is. This is a sloppily assembled attempt to cash in on the last dregs of Beatlemania—not that we need to pass the tin cup for the Beatles or their heirs—but as an effort to separate Beatles' fans from their money, the producers of this disc have a lot to answer for. Presumably it was a rights and clearances issue, but the first thing to mention about this set is that it doesn't include a single note of Beatles music. A band called the Overtures has been assembled to play some Beatles-like tunes, and to cover a few (e.g., A Taste of Honey) that the Beatles recorded—but the Beatles without Beatles songs is like Hamlet without Hamlet. That aside, does this offer anything else? Not really, no. There are many, many shots of the Beatles in their early heyday stepping off of planes and being greeted by hordes of shrieking fans—in London, Paris, New York, Sydney, Tokyo. (If you've got a tarmac fetish, this may have some unintended pleasures for you.) There's also some footage of contemporary Beatles paraphernalia—wigs, hats, shirts—that will make your inner eBayer hungry with desire. But that's about it. The chronology is baffling—the film starts not with the band's formation, but with a discussion of George Harrison's songwriting prowess, versus that of Lennon and McCartney; and the filmmakers can't ever be bothered to provide the basic facts of the story. There's lots of speculation on internecine band politics, but little insight; Yoko Ono and John Lennon's protests against the Vietnam War get lots of play, too. Then, watching this film, you'd never know that the Beatles broke up. It hops from 1968 or so to the assassination of John Lennon, and the filmmakers have the bad taste to include an extended excerpt of an interview Barbara Walters conducted with Mark David Chapman, Lennon's murderer. ("I thought by killing him, I would acquire his fame.") The next event worth mentioning is the intruder who knifed George Harrison; then news footage of the reaction to Harrison's untimely death, including some well-chosen words from Tony Blair. For reasons that remain mysterious, we flop back to the early 1960s now, for more interview footage of the band in their earliest days. This is sordid and shoddy stuff, poorly put together. The Beatles, their legacy, their music and their fans deserve much better than this. Image Transfer Review: The picture quality of the many archival clips vary, and they all seem to have been dumped onto this disc with little or no care. Colors are muddy, and the blacks and whites are awfully murky. Audio Transfer Review: A loud, loud PCM track with a tremendous amount of hiss. The words are comprehensible, at least. Extras Review: The accompanying audio CD (51m:58s) doesn't include any music, but instead offers eleven cuts—some as short as forty seconds—of various press conferences and interviews with members of the band, ranging from 1964 to 1972. John and Yoko get the most attention here, with particular emphasis on their anti-war protests and their famous bed-in. 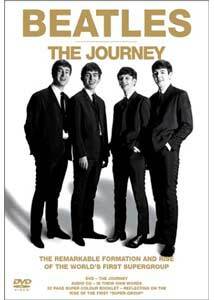 An accompanying booklet offers photographs with lots of trite and ungrammatical copy, some biographical notes, and odd observations on a dozen or so Beatles songs. (E.g. : "If I Fell is one of Lennon's most beautiful songs, it concerns an illicit relationship, in which he asks a woman that if he desserts [sic] his wife for her, will she love him forever. This was to happen when he met Yoko.") The biography on the DVD is a collective one for all four band members; and insult to injury is that the menus here are exceedingly difficult to negotiate. This is a seriously bottom-shelf venture, an attempt to exploit our fondness for the Beatles by producing a set that includes none of their music and little or no insight. Even the most diehard Beatlemaniac would have a hard time justifying a purchase of this one.